How do we respond to people who hate what we believe as Christians? Listen to this beginning lesson in a series on marriage as you face friends and family who wonder why you object to "gay marriage". 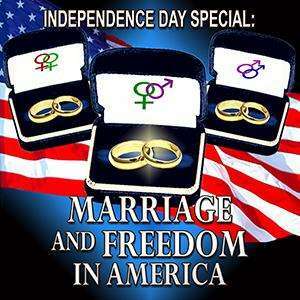 Hear the thoughts of a number of famous Americans who through the years have legally defined marriage and its importance to the well being of the nation. See that arguing will not convince anyone but rather find out that your defense must come out of your ultimate beliefs about reality. As you encounter those who think Christians are purveyors of hate, see that you must treat them in kindness as you point out the truth of God’s Word. Do you see the recent Supreme Court ruling on marriage as the saddest day in American history or as an opportunity to witness to others about God’s love for them? Listen to this lesson to learn Biblical reasons for marriage and God’s first command concerning marriage. Accept the reality that Christians will be considered the enemy and how we need to lovingly treat those who disagree with us. Seek to rise above your anger and despair and become a positive force by advancing to spiritual maturity. Do what makes you happy. Is that the best way to live? Listen to this lesson to learn that our founding fathers emphasized that virtue, not pleasure, must be the highest value if our country is to prosper. Learn that marriage has always been under assault because it is an institution established by God to promote freedom and virtue and training for the next generation. Hear about eleven benefits of marriage the way it was planned by God. See that failure in marriage does not indict the institution of marriage. Learn about assaults on marriage recorded in the Bible, including the one in Sodom. Understand that not only sexual sins but all sins are an abomination to God and deal with those involved in them by giving them the gospel in a loving manner. Why do some nations prosper and become a force for good in the world while others decline and disappear from history? Listen to this lesson to learn that God’s Word lays out how a nation can implode by allowing passions and immorality to be uncontrolled. Hear the sins that are an attack on the divine institutions of marriage and family. Learn common myths about homosexuality and the answer to those myths both from science and the Bible. Finally listen to six things that Christians can do in light of this Supreme Court decision, including praying without ceasing and letting our views be known in the marketplace.